This tutorial covers various ways to execute loops in python. Loops is an important concept of any programming language which performs iterations i.e. run specific code repeatedly until a certain condition is reached. Software of the ATM machine is in a loop to process transaction after transaction until you acknowledge that you have no more to do. Software program in a mobile device allows user to unlock the mobile with 5 password attempts. After that it resets mobile device. You put your favorite song on a repeat mode. It is also a loop. You want to run a particular analysis on each column of your data set. Like R and C programming language, you can use for loop in Python. It is one of the most commonly used loop method to automate the repetitive tasks. Suppose you are asked to print sequence of numbers from 1 to 9, increment by 2. What is the shape? Everything has a shape. scalars, vectors, arrays, operations, and functions. What are the given indicies and operations required to produce a given index in the result? The post NumFOCUS Hires Executive Operations Administrator appeared first on NumFOCUS. What's up with current peer review practice? This article explains various ways to create dummy or random data in Python for practice. Like R, we can create dummy data frames using pandas and numpy packages. Most of the analysts prepare data in MS Excel. Later they import it into Python to hone their data wrangling skills in Python. This is not an efficient approach. The efficient approach is to prepare random data in Python and use it later for data manipulation. The post The Human Element in AI appeared first on Anaconda. The post AnacondaCON 2019 Day 3 Recap: The Need for Speed, “Delightful UX” in Dev Tools, LOTR Jokes and More. appeared first on Anaconda. The post NumFOCUS Releases 2018 Annual Report appeared first on NumFOCUS. The post NumFOCUS Announces Cambridge Spark will Host a PyData Conference in 2019 appeared first on NumFOCUS. In his blog post welcoming me, Travis set out his vision for pushing forward the Python ecosystem for scientific computing and data science, and how to fund it. In this post I'll add my own perspectives to that. Given that Quansight Labs' purpose, it seems fitting to start with how I see things as a community member and organizer. The post Anaconda 2019.03 Release appeared first on Anaconda. The post AnacondaCON 2019 Day 2 Recap: AI in Medicine, Cataloging the Contents of Stars, and More! appeared first on Anaconda. The post AnacondaCON 2019 Day 1 Recap: Big-Time Learning appeared first on Anaconda. The post 3 Ways to Upskill in Python with DataCamp and Anaconda appeared first on Anaconda. The post Now Hiring: Development Director appeared first on NumFOCUS. The post Facebook joins NumFOCUS Corporate Sponsors appeared first on NumFOCUS. The post NumFOCUS Welcomes Sam Brice as inaugural Visiting Fellow appeared first on NumFOCUS. The post Anaconda Enterprise 5.3 Release appeared first on Anaconda. The post Announcing Public Anaconda Package Download Data appeared first on Anaconda. I noticed that as my personal website at my former university went down that my PhD thesis could not be found anywhere, so I'm posting it here. The post NumFOCUS Hires New Staff to Support Events and Financial Services appeared first on NumFOCUS. The post Understanding and Improving Conda’s performance appeared first on Anaconda. The post End of Life (EOL) for Python 2.7 is coming. Are you ready? appeared first on Anaconda. The post Blosc joins NumFOCUS Sponsored Projects appeared first on NumFOCUS. The post Gina Helfrich on the Changelog Podcast appeared first on NumFOCUS. Threat models for open online scientific engagement? What threats are there for scientists in engaging in open online discussions? The post Intake released on Conda-Forge appeared first on Anaconda. The post NumFOCUS Announces Netflix as Corporate Sponsor appeared first on NumFOCUS. The post RPM and Debian Repositories for Miniconda appeared first on Anaconda. The question du jour: how should authorship on software papers be decided? The post Julia Co-Creators To Receive 2019 James H. Wilkinson Prize for Numerical Software appeared first on NumFOCUS. The following code creates and manipulates 2 TB of randomly generated data. On a single CPU, this computation takes two hours. On an eight-GPU single-node system this computation takes nineteen seconds. Actually this computation isn’t that impressive. It’s a simple workload, for which most of the time is spent creating and destroying random data. The computation and communication patterns are simple, reflecting the simplicity commonly found in data processing workloads. CuPy provides a partial implementation of Numpy on the GPU. Dask Array provides chunked algorithms on top of Numpy-like libraries like Numpy and CuPy. Measuring acceleration and rotation has a lot of useful applications, from drone or rocket stablisation to making physically interactive handheld games. TL;DR: Create a conda environment for each project, capture exact versions when possible, automate activation and updating with a bash function. I recently moved from Anaconda to NVIDIA within the RAPIDS team, which is building a PyData-friendly GPU-enabled data science stack. For my first week I explored some of the current challenges of working with GPUs in the PyData ecosystem. This post shares my first impressions and also outlines plans for near-term work. First, lets start with the value proposition of GPUs, significant speed increases over traditional CPUs. Like many PyData developers, I’m loosely aware that GPUs are sometimes fast, but don’t deal with them often enough to have strong feeling about them. The post Double Your Donation: NumFOCUS Receives $5,000 Matching Gift Challenge (updated: SUCCESS!) appeared first on NumFOCUS. Using short and long reads to assemble genomes from metagenomes! This blog post extends the convergence theory from the first part of my notes on the Frank-Wolfe (FW) algorithm with convergence guarantees on the primal-dual gap which generalize and strengthen the convergence guarantees obtained in the first part. It takes constant work to make a welcoming teaching/learning environment! Where we store links to emails in org-mode, and open them using neomutt. Welcome new open source contributor! I appreciated receiving the e-mail where you said you were excited about getting into open source and were particularly interested in working on a project that I maintain. This post has a few thoughts on the topic. First, please forgive me for sending you to this post rather than responding with a personal e-mail. Your situation is common today, so I thought I’d write up thoughts in a public place, rather than respond personally. An ESP2866 is never going to compete with an actual graphics card. But it has more than enough oomph to explore the fundamentals of 3D graphics. In this short tutorial we'll go through the basics of creating a 3D scene and displaying it on an OLED screen using MicroPython. To increase transparency I’m trying to blog more often about the current work going on around Dask and related projects. Nothing here is ready for production. This blogpost is written in haste, so refined polish should not be expected. Retire the hdfs3 library in favor of the solution in Apache Arrow. Verde is a Python library for processing spatial data (bathymetry, geophysics surveys, etc) and interpolating it on regular grids (i.e., gridding). It implements Green's functions based interpolation methods and other data processing routines. The type of gridding implemented in Verde is essentially fitting various linear models to spatial data and using them to predict new data on regular grids, which is what a lot of machine learning is all about. So Verde's gridder API is inspired on scikit-learn, the state-of-the-art for machine learning in Python. The Green's functions that make up the Jacobian matrix (aka sensitivity or feature matrix) of the linear models generally come from elastic deformation theory. For example, the bi-harmonic spline (Sandwell, 1987) implemented in verde.Spline comes from the deformation of a thin elastic plate. I discuss a recently proposed optimization algorithm: the Davis-Yin three operator splitting. This work is supported by Anaconda Inc.
I’m pleased to announce the release of Dask version 0.19.0. This is a major release with bug fixes and new features. The last release was 0.18.2 on July 23rd. This blogpost outlines notable changes since the last release blogpost for 0.18.0 on June 14th. A ton of work has happened over the past two months, but most of the changes are small and diffuse. Stability, feature parity with upstream libraries (like Numpy and Pandas), and performance have all significantly improved, but in ways that are difficult to condense into blogpost form. That being said, here are a few of the more exciting changes in the new release. We’ve dropped official support for Python 3.4 and added official support for Python 3.7. How do we support and sustain open source software development? How does Dask dataframe performance compare to Pandas? Also, what about Spark dataframes and what about Arrow? How do they compare? I get this question every few weeks. This post is to avoid repetition. This question and answer are very high level. More technical answers are possible, but not contained here. If you’re coming from Python and have smallish datasets then Pandas is the right choice. It’s usable, widely understood, efficient, and well maintained. We've previously covered the basics of driving OLED I2C displays from MicroPython, including simple graphics commands and text. Here we look at displaying monochrome 1 bit-per-pixel images and animations using MicroPython on a Wemos D1. These mini monochrome OLED screens make great displays for projects — perfect for data readout, simple UIs or monochrome games. The Raindar UI was created using Qt Designer, and saved as .ui file, which is available for download. This was converted to an importable Python file using pyuic5. As general purpose open source software displaces domain-specific all-in-one solutions, many institutions are re-assessing how they build and maintain software to support their users. This is true across for-profit enterprises, government agencies, universities, and home-grown communities. While this shift brings opportunities for growth and efficiency, it also raises questions and challenges about how these institutions should best serve their communities as they grow increasingly dependent on software developed and controlled outside of their organization. How do they ensure that this software will persist for many years? How do they influence this software to better serve the needs of their users? How do they transition users from previous all-in-one solutions to a new open source platform? How do they continue to employ their existing employees who have historically maintained software in this field? If they have a mandate to support this field, what is the best role for them to play, and how can they justify their efforts to the groups that control their budget? Bits cannot be the basis for a digital commons, because they are not rivalrous. Spyder 3.3.0 and 3.3.1 released! We're pleased to release the next significant update in the stable Spyder 3 line, 3.3.0, along with its follow-on bugfix point release, 3.3.1, which is now live on PyPI and conda. 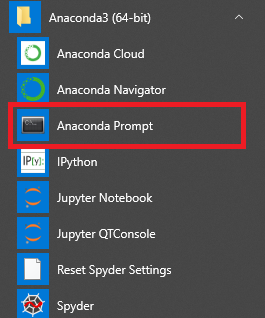 As always, you can update with conda update spyder in the Anaconda Prompt/Terminal/command line (on Windows/macOS/Linux, respectively) if on Anaconda (recommended), or pip update spyder otherwise. If you run into any trouble, please carefully read our new installation documentation and consult our Troubleshooting Guide, which contains straightforward solutions to the vast majority of install-related issues users have reported. Quansight, the company recently founded by NumPy, SciPy and Anaconda creator Travis Oliphant to help connect companies with open source communities built around data science and machine learning, just released Episode 1 of its live webcast series, and it was all about Spyder! Spyder maintainer Carlos Córdoba, recently hired by Quansight and funded part-time to work on Spyder development as we announced a few weeks ago, was the featured guest on the show. In the last months, as part of the Google Summer of Code 2018, I have been working on a project that aimed to implement neuronal models which represent averaged population activity on NeuroML2/LEMS. The project was supported by the INCF organisation and my mentor, Padraig Gleeson, and I had 3 months to shape and bring to life all the ideas that we had in our heads. This blog post summarises the core motivation of the project, the technical challenges, what I have done, and future steps. Are "effort" and "labor" the same? Two weeks ago, we held a scikit-learn sprint in Austin and Paris. Here is a brief report, on progresses and challenges. This is a list of the websites I use to search for academic jobs in the Earth Sciences (geophysics, geology, oceanography, meteorology, etc). They've been very useful to me (I found my current position through the CIG mailing list) and I hope that this post can help others who are looking to take the next step in their academic careers. These sites list everything from Masters and PhD scholarships to postdoc positions and tenure-track professorships. Note that they are biased toward the US, Canada, Oceania, and Europe. After sharing some major milestones, development progress, and other tidbits from the past six months in Part 1 of this series (check that one out first if you haven't already), we now have some amazing news to share with you all here in Part 2, along with other status updates. That's not all, though—Part 3 will look ahead toward Spyder 4 and beyond, unveiling and explaining our full roadmap and going over the future possibilities even further afield. Pooch is a Python package that manages downloading data files over HTTP and storing them in a local directory. It is meant to be used by other Python libraries that ship sample data files for use in documentation, workshops, demos, etc. For example, your package could define a datasets.py module that has functions to load sample data (like scikit-learn does). If you want the data to live on the web (like in the Github repo) instead of shipping it with your package, Pooch can keep track of it and download it to the user's computer only when it's needed. We need an Open Source Anti-Sisyphean League! Planet SciPy – I Love Symposia! To add/remove blogs, send a pull request. Contact: issue tracker. All blog posts are by third parties, not scipy.org. The posts are aggregated here by an automated mechanism, staticplanet.